Bulk Rename Utility is a Portable Free Bulk File Renamer. 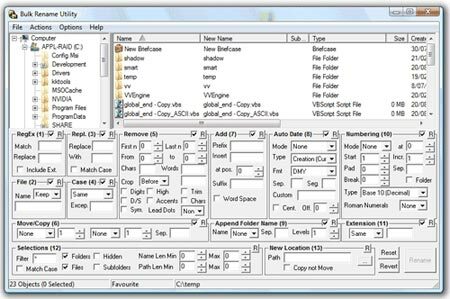 It can be used to rename multiple files at once. In addition the Bulk File Rename Utility can be used to add, replace, insert text into file names. Convert case, add numbers. Remove or change file extensions. Rename MP3 files (MP3 ID tag renaming), using EXIF meta data, Rename pictures from dsc1980.jpg to mycat.jpg etc.